I met “K” (an ex-colleague of mine) last week in Delhi when I was on official travel. It’s been 6 long years after which we met though we both are well connected through social networking sites. “K” is one of the loyal followers of my blog since inception and she often gives valuable suggestions to improve my blog. I visit Delhi quite often after shifting my base to Kolkata for official core and try to meet old buddies in the evening though my meeting with “K” was completely unplanned. It was the evening of Thursday when I was casually checking the FB feed after office and I have decided to go to Dilli Haat for some “Prop” shopping and suddenly saw a ping from “K” and I was informed that she was also in Delhi at that time and within 5 minutes we both decided to meet at Dilli Haat and then 2 hours of complete gossip, chat, chai, shopping and a small box of Mawa cake that she brought for me! Since “K” is from Mumbai; whenever she travels she packs Mawa cakes for her friends outside Mumbai and during this trip she was available with last two pieces of Mawa cakes which she brought for me! It was just amazing to have the Mawa Cake after a long time from a famous shop. I had it last time in 2008 when I visited Mumbai to attend a conference there though I make it quite often in my place ! 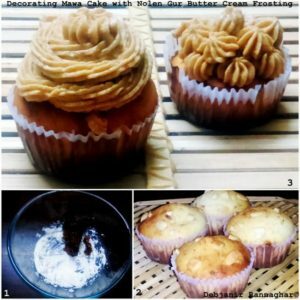 While returning home I was planning to make Mawa Cake again but was continuously thinking to give it a twist of Bengal and finally ended on making Mawa Cupcake with Nolen Gur Butter Cream Frosting this week and believe me it is a successful attempt of matching Mumbai Mawa Cake with Bong Nolen Gur! I made Mawa Cakes before several times and in fact had it whenever I went to Mumbai in the traditional age-old Iranian Cafe’s which are kind of synonymous with the “Bawa” culture of Mumbai. 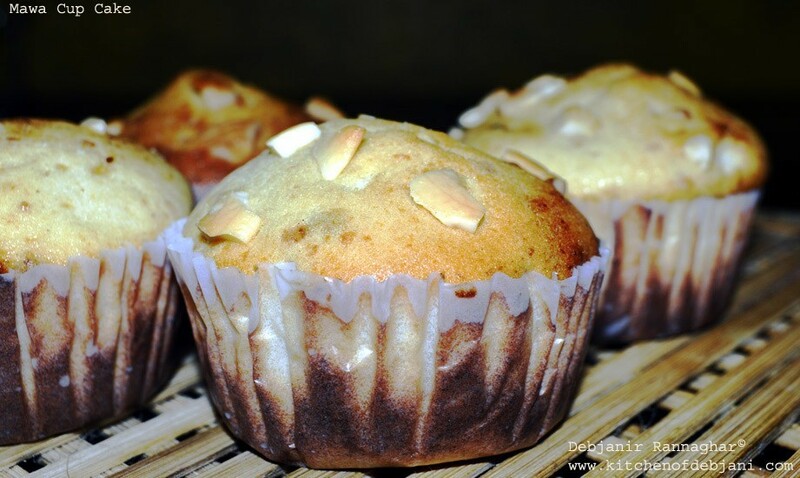 Mawa Cake possesses a typical Indian flavor given Mawa or reduced milk solid is the heart of this cake and it is more of a muffin than a cupcake. 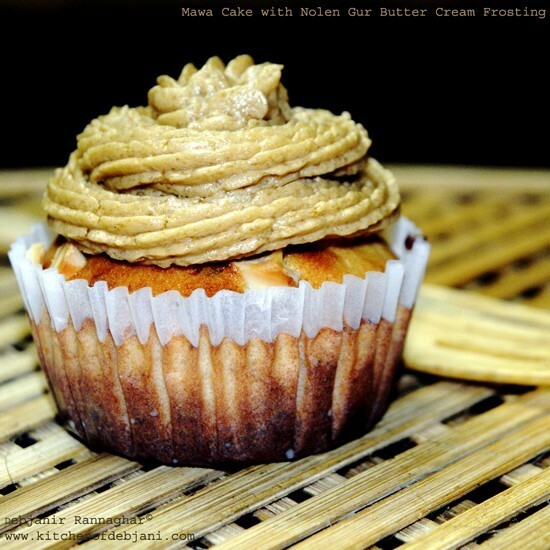 However, I was thinking to give it a bong twist with a bit moist texture and what could have been better than using “Nolen Gur” to match with the richness of Mawa and I ended on making a Nolen Gur flavored Butter Cream and rest is voila! 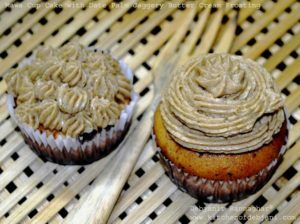 A perfect moist Mawa Cupcake with Nolen Gur Butter Cream Frosting; my attempt at linking the Mumbai flavor with the Bong delicacy. A traditional Cake originally from Mumbai; Mawa cake with a bong twist! 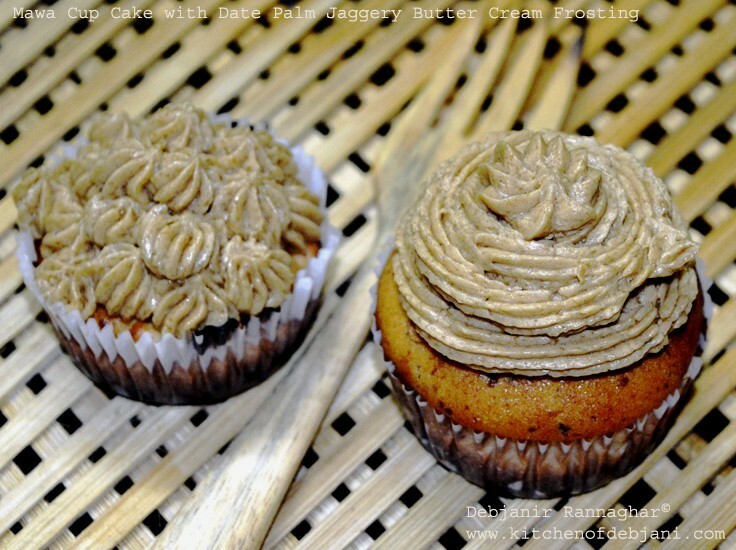 the cake is garnished with butter cream flavored with Bengal's famous Date Palm jaggery or Nolen Gur! Take All Purpose Flour and shift it twice along with the baking powder and salt. Make a powder of Green Cardamom seed and mix the cardamom powder with the flour mix. Grate Mawa using a food grater and keep that aside. Mawa has to be at room temperature. Take unsalted butter at room temperature in a bowl and using a blended cream the butter. Add powdered sugar to butter and blend it for around 1 minute on medium speed to mix sugar properly with the butter. Now add grated Mawa to the mixture and using the blender mix it properly. Add 100 ml of milk to the mixture and blend it again and keep remaining milk aside. Now add two eggs at room temperature to the mixture and blend for 30 seconds to mix properly. 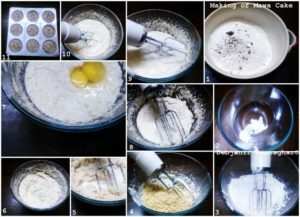 Now add flour mixture in three batches to the Mawa mixture and using the blender mix until turn smooth. If found the mixture too sticky add the little milk to dilute it. Now line a muffin tin with cupcake liners and fill ⅔ of each cupcake liner with the batter and bake in 180-degree c for 18-20 minutes. Check in between especially after 15 minutes by inserting a toothpick in the middle of the cakes to check the doneness. It took me 20 minutes to bake the cakes. Take Mawa Cakes out of the oven and cool on wire rack. Grate the slab of Nolen Gur / Patali Gur/ Date palm jaggery using a food grater. Both Nolen Gur and Butter have to be at room temperature for making the Gur flavored buttercream. Take Butter in a bowl and using hand blender cream it perfectly. It took me around 40 seconds to cream the butter. Now add grated Nolen Gur to the butter and using the blender mix it properly. Add icing sugar and blend again until the mixture turns creamy completely. Take the Nolen Gur Buttercream in a piping bag fitted with a nozzle of your choice. Start piping each Cupcake with desired shapes. Serve Mawa Cupcake with Nolen Gur Butter Cream Frosting either at room temperature or after refrigerating it for few hours. I am sending this recipe to the Christmas event of Kolkata Food Bloggers.